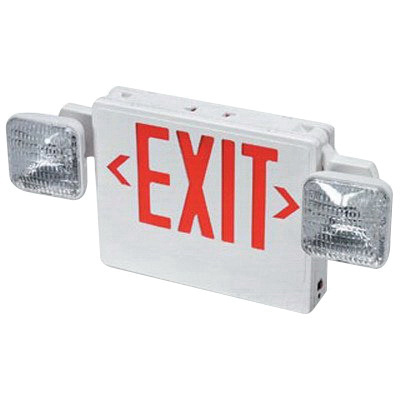 Chloride VC Series Combination exit and emergency LED light unit in white color, features thermoplastic housing and sealed lead acid battery. The "EXIT" legend is illuminated by red tungsten LED lamp. It has a dimension of 21-5/8-Inch x 14-7/8-Inch. The 5.4-Watt LED lamp has voltage rating of 120/277-Volt AC and current rating of 0.03 - 0.013-Amp. The economy grade unit has sealed nickel cadmium battery with a runtime of 90 mins and a lifetime of 7 years. The commercial universal wall/ceiling mount unit withstands a temperature rating of 65 to 85 deg F.